Are you looking for a way to change your computer station? I am a big fan of L-shaped acrylic picture frames. They make great sign holders. The signs help with answering all of the “what was I supposed to do?” questions. 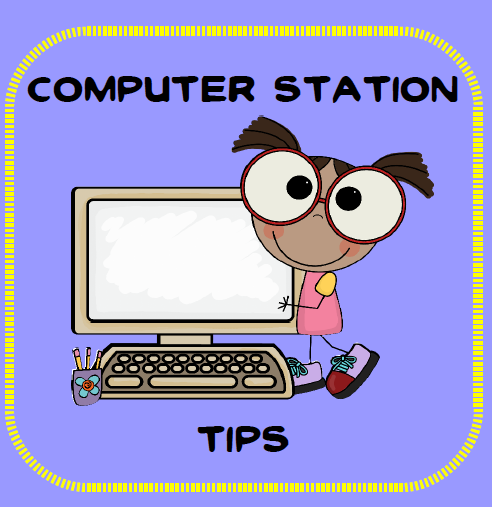 If you use your computer stations for reading and math, you can use different colored background for the different subjects. Did you notice the polka-dotted table cloth? Isn’t it cute? The plastic flannel backed table cloth is such a quick and easy way to add color and seasonal flair to any classroom. You can find cheap ones at Dollar Tree. I bought this one for $2 at Staples. « Do you ever feel like the Verizon guy? I love the idea of using the frames! I love them, too, because you can write on them with a dry erase marker! Makes for an interesting center!! I didn't think about that (writing on them). Good tip! Thanks for sharing!